Features Fixed, Three Column, Blue, Left And Right Sidebar, Ads, Christmas. Descriptions Christmas Eve is special christmas themes, best christmas design template, christmas themes, blue color background is basic color for this blogger templates, very good themes with vector design for sidebar, 3 columns layout with left and right sidebar for basic layout, this themes have good design related about home and nature for basic design this themes. 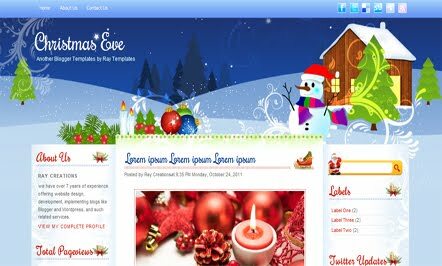 Download Christmas Eve Blogger Template at Blogger Templates Gallery.